When TLD, the leading industrial group in airport ground support equipment, began scaling to international locations, their mission-critical applications stopped performing at the speed customers and employees were expecting. Learn how TLD replaced their legacy IPsec-VPN network with Aryaka SmartCONNECT to increase productivity and reduce worldwide user complaints about application performance. 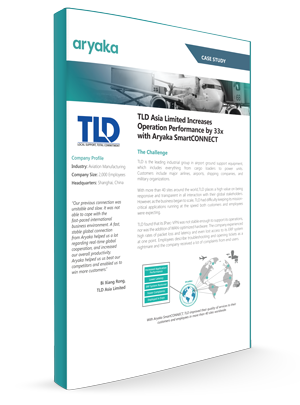 How TLD increased application performance through Aryaka SmartCONNECT and increased productivity by 33x. How Aryaka reduces optimizes data across global locations to improve quality of services worldwide. How TLD was able to deploy a global private network in less than one day with zero CapEx.